The J. Michael Cleveley’sWeb Site covers the life and times of Larry A. Thorne (Lauri Torni). His book on Finnish-American has become a classic war history in Finland. An English version of thebook (A Scent of Glory) was published in Greece in 2003. A new edition in English is now available in the United States under the title “Born a Soldier, the Life and Times of Larry Thorne”. A Swedish version (Lauri Torni Yrke: Soldat) was also a best seller. The Green Beret Foundation (GBF) assists wounded Special Forces soldiers and their families. 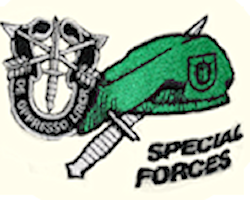 Visit the GBF Website and learn more about their role in the Special Forces Community. Civilians have no concept of what th military does except what is told to them by the media and TV. This web site, The Military View gives you the real side of the story---as told by the military itself. Copyright @copy; 1994 Chapter XXXIII SFA. All rights Reserved.